Accounting for greater than 90% of all skin cancers occurring among Americans, basal cell carcinoma (BCC) is the most prevalent type. While it rarely metastasizes (spreads) to other sites in the body, BCC may cause damage to surrounding tissues. Find out about the warning signs of BCC, the causes of BCC, risk factors for BCC, and BCC prevention measures. A sore resembling a scar when there is no injury to the area. While the causes of many types of cancers are not known, the specific cause of BCC is harmful ultraviolet rays from the sun or the use of tanning beds. When these rays come in contact with the skin, they damage each skin cell’s DNA. The body attempts to fix the skin damage, but when it is repeatedly exposed, it can no longer adequately repair itself. When the body can no longer repair the damage caused by ultraviolet rays, skin cancer develops. Generally speaking, BCC skin cancer tends to appear many years after the initial overexposure to the sun or tanning beds. When a patient reaches approximately fifty years of age, chances of developing BCC and other skin cancers are significantly increased. Younger individuals can also develop basal cell carcinoma. The majority of those affected are younger women who make use of indoor tanning beds. Most of these BCCs are preventable by never starting to tan indoors at all. All people can develop BCC, the most common form of skin cancer. 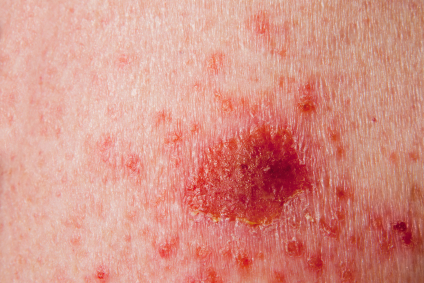 However, some individuals are at an increased risk for developing basal cell carcinoma. Patients with risk factors for BCC have at least one or more contributing factors: their individual physical traits, taking part in activities which lead to BCC, and their personal medical history.